Weightlifting in a home gym or professional gym everyone needs to check their form while doing their workout, that’s where fitness mirrors come in. Our recommendation is to install gym mirrors above the outlet level (usually 16″-22″ from the floor). At that height you’ll be able to see about a foot below your feet and a foot above your head any distance from the mirror (the mirror doesn’t have to be on the floor to see your feet). 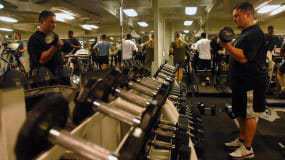 A front and side gym mirror is recommended for best results. This height also works well while standing on a treadmill or stairclimber, a workout mirror In front of you is better than staring at a wall and it helps with balance. Try to avoid having your new gym mirrors mounted directly across from each other in a small room, mirror reflecting mirror creates an unpleasant tunnel effect. Where ballet mirrors and dance mirrors would also be mounted 16″-22″ from the floor, yoga mirrors and Pilates mirrors need to be mounted on the floor, because these are activities done while laying down. Your eyes are closer to the floor so the yoga mirrors need to be closer to the floor. Keep in mind though, our ballet mirrors are 6’x8 ‘, if we mount them on the floor 6′ high and 8′ wide they may not work well if your yoga studio also teaches dance or ballet, the mirrors wont be high enough. You may want to have them installed 6′ wide and 8′ tall. It would take more mirrors to fill the space (more $$$), but it works well for all activities. The other major factor to consider with ballet mirrors is the ballet barre. In the past, glass shops have drilled holes in the mirrors to mount the ballet barre, this is very expensive and ends up over time with chips and cracks in the mirror from stress . The simplest way is to either use a floor mounted barre or mount a wood strip the entire length of the ballet barre about 4″-6″ wide (glued and screwed) to the wall at your preferred distance from the floor, mount your ballet barre brackets to that, then we’ll mount your new ballet mirrors above and below that strip of wood. This way drastically cuts the chances of accidental breakage from weak spots in the mirror and saving you hundreds of dollars in drilling charges and breakage later. Form is especially important in this category for martial arts studio mirrors. Whether you are practicing Karate, Tae Kwon Do, or any of the other martial arts, mirrors are essential to the Dojo. 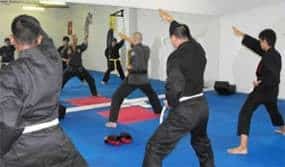 Most martial arts studios only do 25-35′ of mirrored walls, that’s really all they need for class sizes of 15-20 students. The karate mirrors should again be mounted 16″-22″ off the floor (we prefer 16″) with so many small children taking up the sport, they need to see their feet as well as the adults. However, the lower the karate mirror, the more likely it is to get kicked. Try to mirror the wall farthest from the kicking, tumbling, and throwing. We recommend an additional wooden frame (2″x4″) to protect the edge of the mirror, which is the most vulnerable to breakage. You can add the wood frame after we leave, if you feel your students are a little on the wild side.